Cutting sheet metals will never be the same with Lnchett professional nibbler. It's light, compact and sleek. 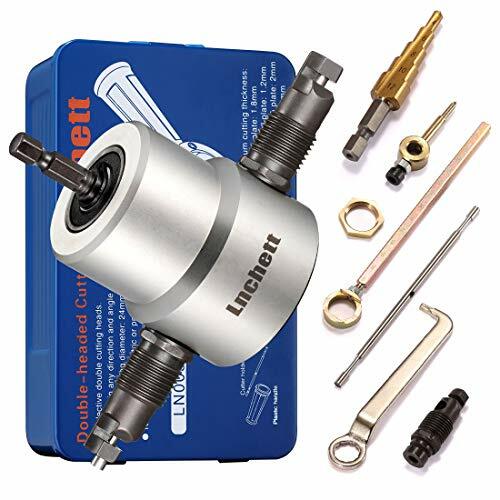 Powered by a standard drill between 1500-3000 RPM, just simply insert the drive shaft in the chuck of your drill and tighten the chuck, exactly like putting in a drill bit. when you start up the drill and the nibbler will be ready to cut. It will be a big time saver for cutting sheet metal and corrugated metal roof sheets. the 360 degree adjustable cutting head allows easy control and has no problem handling any curve or straight you throw to it. Versatile cutting round accessories helps you to easily cut straight and round .Also the iron tool box which holds all parts in helps you no worry to carry them anywhere or lose any. If you have any questions about this product by Lnchett, contact us by completing and submitting the form below. If you are looking for a specif part number, please include it with your message.